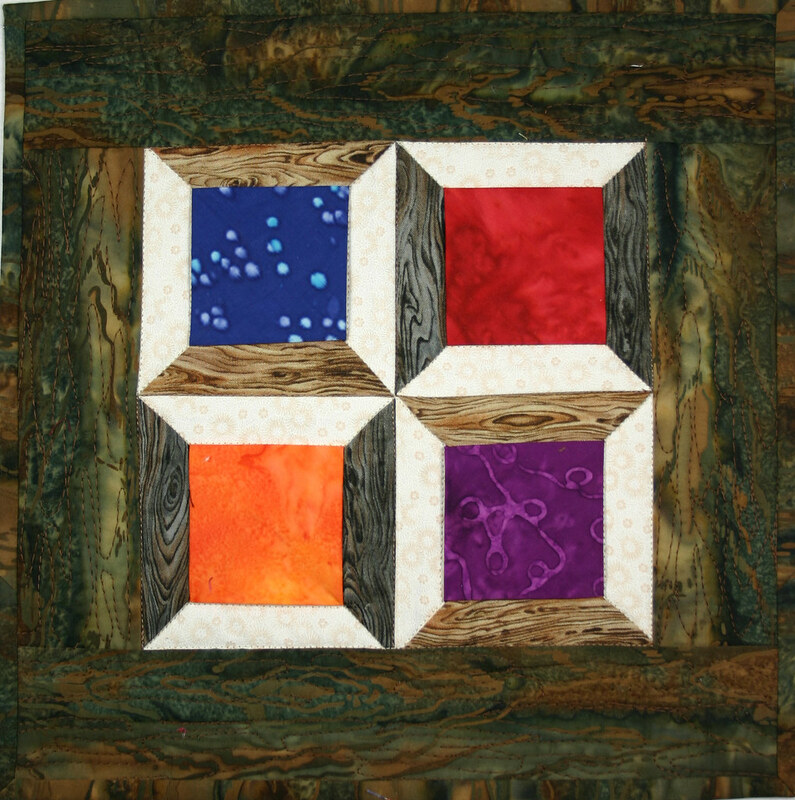 This post is a shout out to the About.com list that has been talking about my 3D Spools quilt and visiting my Blog. They motivated me to get my Twilts going again. My “Thread Spools” Twilt uses the same three-dimensional method as the Bow Tie block that my method of Cathedral Windows is based on. It uses triangles instead of background squares. Just for the About.com folks here’s a quick tutorial for a 4 1/2″ spool block. 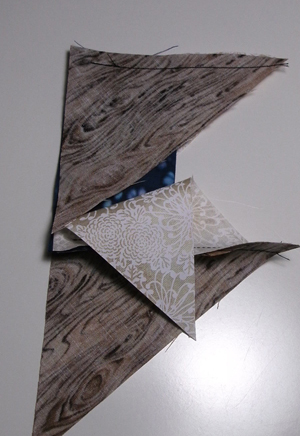 From fabric that looks like wood and white on white fabric cut strips 2 3/4″ each. From the strip make 45″ cuts to get half square triangles with the straight on grain on the long side. Use the 45 degree line on the ruler. You end up flipping the ruler back and forth. A spinning mat helps. 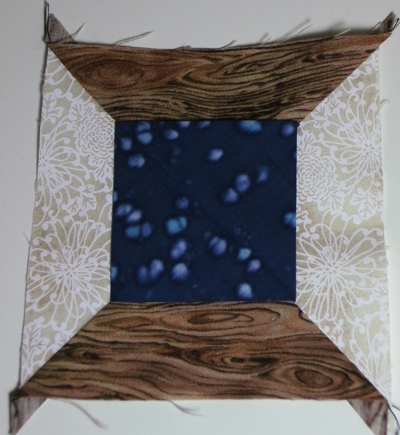 For the colored fabric that represents the thread cut 4″ squares. 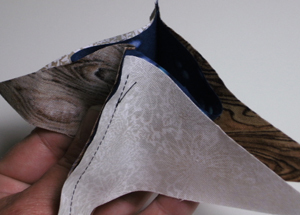 Fold the thread fabric in half , right sides out, with the fold to the right and sandwich between a wood triangle and a white triangle, right sides in, lining up the four raw edge corners. 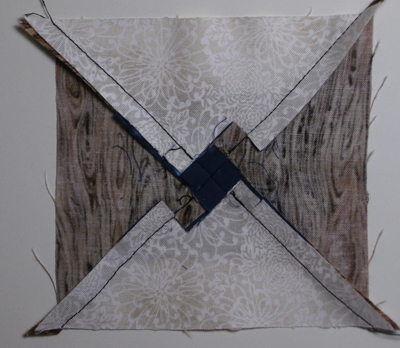 The fold of the square should be towards the center of the seam and you should stitch across it. Stitch the seam leaving the first 1/4″ open. I backstitch at the beginning of the seam. 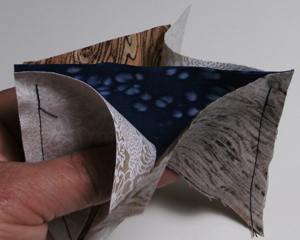 Flip the piece around and sew triangles on the other end in the same order and manner. 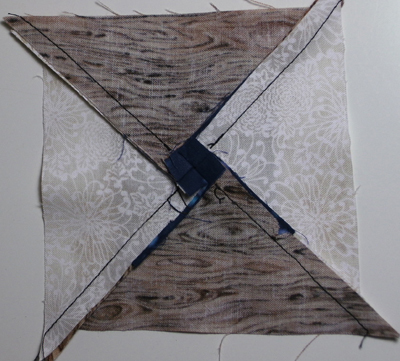 Open the center square and pull the seam allowances together. Line up the triangles to the right of the seam allowances and sew in the same manner as the previous two seams. Turn the piece around and sew the final seam. Pull the piece flat. Press from the back spiraling the seams around the center. The seams in the center with look like a little four patch when flattened. If you want to press towards the dark fabric then clip the two seams beneath the square and press the outer section towards the dark. Trim up the blocks as necessary. I know this is a quick set of instructions and I might just write up a pattern but I thought you might want to give it a try now. Let me know how you do.